Having a professional tile cleaning done by Carter’s Carpet Restoration can drastically improve the look of your tile floors. A steam tile cleaning will remove years of built up soil, oil, and grime from your tile surface and grout lines – just look at the drastic change in the photo below! A steam tile cleaning uses the non-abrasive power of steam to agitate the soil in your grout lines. This high pressure steam can reach places that surface scrubbing just can’t get to. The result is a deeper, more visible clean. Carter’s unique over-sized trucks provide you with the highest temperature steam, and the strongest extraction power available. High temperature steam AND extraction or vacuum power are key for impressive tile cleaning. With tile cleaning, steam is important but extraction power is the real hero. The pressure of the steam loosens and agitates the soil. But if the soil isn’t extracted during the tile cleaning, it will just be moved around and eventually re-settle into the grout lines. That’s where extraction or vacuum comes in. Carter trucks have about 30% more vacuum power than the average cleaning machine. The suction on the trucks is amazing, and will remove the layers of soil, dust, and oil that have built up on your tile and grout. 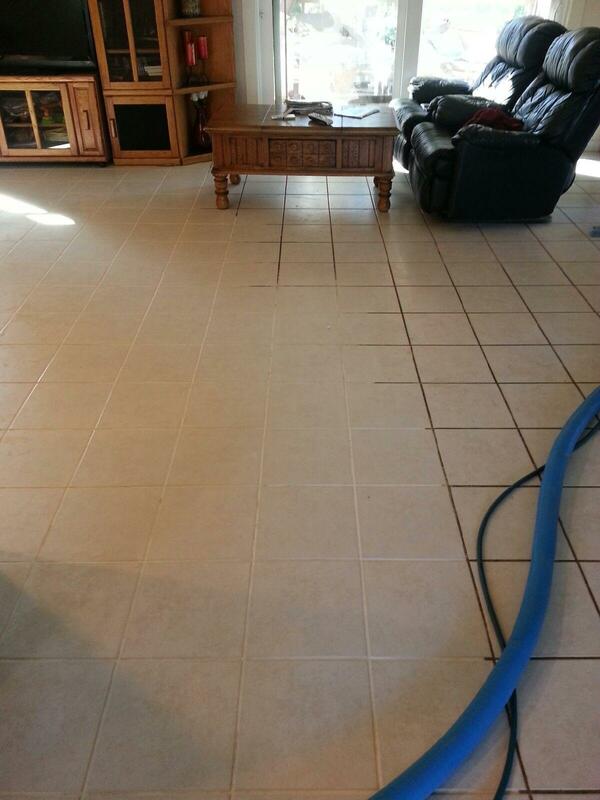 Tile cleaning photo take by a CCR technician while on a job. Please visit Tile, Stone, and Grout Cleaning for an in-depth description of the tile cleaning process. Additionally, there are videos showing the actual cleaning footage. Carter’s offers free estimates on all cleaning services. Call today if you’d like to schedule a time for a Carter technician to visit your home! 916-933-7807. If you’re looking for an at-home tile cleaning product, Carter’s Carpet Restoration recommends Stone Tech Revitalizer.